This natural herbal cough syrup recipe is made with ingredients most dogs love. 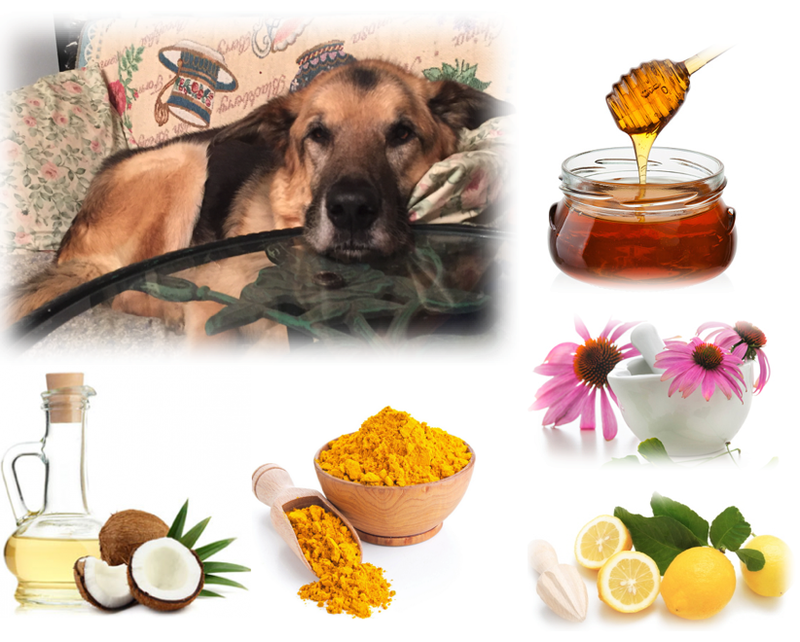 If your dog has a cough due to a viral infection such as a doggie cold or flu, this cough syrup recipe can help sooth your dog’s cough, and help fight the virus, without the side effects of, and toxins in conventional drugs! Coconut oil – use organic liquid coconut oil, not solid coconut oil. Lemon juice, fresh squeezed from real lemons. Honey - 100% pure, natural raw unpasteurized honey. You can use wild flower honey, buckwheat honey, Manuka or another active honey, or an herbal honey. If you are making this recipe for a dog that is under 12 months of age, use pharmaceutical honey, not raw honey. If your dog is allergic to bees, leave the propolis out of the recipe. Slippery elm bark powder, organic. You can double, triple, quadruple the recipe. 1 tsp slippery elm bark powder. 1 tsp or organic turmeric powder, or 1” of fresh very finely minced organic turmeric root. You can give the cough syrup to your dog 1 times, up to 4 times per day as required. Small Dogs – 1/8 tsp, up to ¼ tsp per dose. Medium dogs – ¼ tsp, to ½ tsp per dose. Large Dogs – ½ tsp, up to 1 tsp per dose. If your dog has health conditions, or is on conventional drugs, make sure you check herb, and other natural ingredient interactions and contradictions. I seelemons are toxic to cats so Not safe for cats thank you Love your articles! !